SIMSIDES (SIMulink-based SIgma-DElta Simulator) is a time-domain behavioral simulator for Σ∆Ms that has been developed as a toolbox in the MATLAB/SIMULINK environment. SIMSIDES can be used for simulating any arbitrary Σ∆M architecture, implemented with both discrete-time (DT) and continuous-time (CT) circuit techniques. To this end, a complete list of Σ∆M building blocks (integrators, resonators, quantizers, embedded DACs, etc) is included in the toolboox. The behavioral models of these building blocks take into account the most critical error mechanisms of different circuit techniques including switched-capacitor (SC), switched-current (SI), and continuous-time (CT) circuits. These models, validated through transistor-level electrical simulations and by experimental measurements taken from a number of silicon prototypes, have been incorporated into the SIMULINK© environment as C-MEX S-functions. This approach drastically increases the computational efficiency in terms of CPU time and accuracy of the simulation results. SIMSIDES includes all necessary behavioral models and building blocks to create any arbitrary Σ∆M architecture and simulate it in MATLAB. 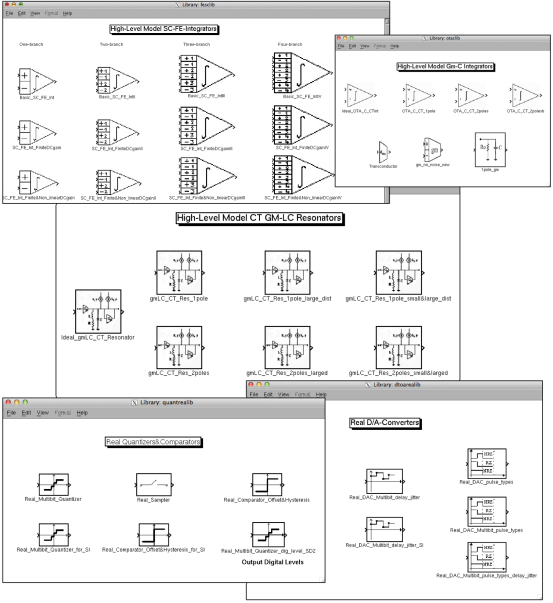 These models are grouped into a number of SIMULINK libraries and sub-libraries which can be easily opened by browsing through SIMSIDES graphical user interface. 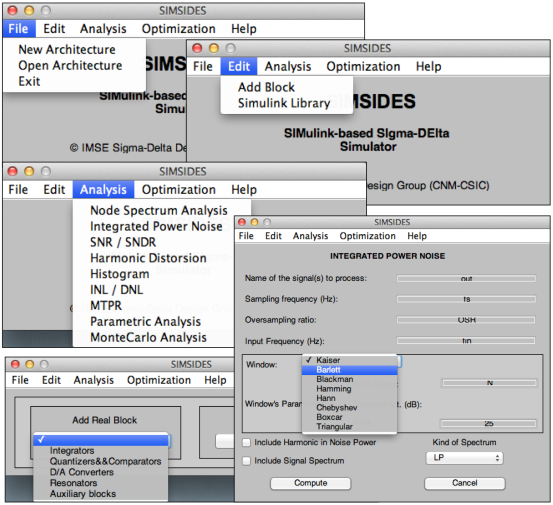 In addition to the model libraries themselves, SIMSIDES includes also some additional libraries with examples of the most commonly used Σ∆M topologies, considering both low-pass and band-pass modulators, single-loop and cascade architectures, single-bit and multi-bit quantization, different circuit techniques, etc. More detailed information about the models and use of SIMSIDES can be found in the user guide and related publications.